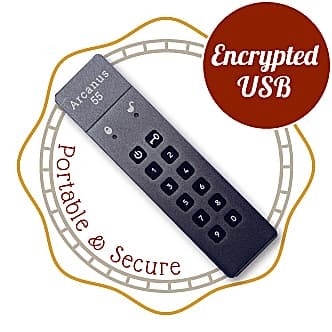 Arcanus 55 ⚡️ Trusted Encrypted USB | Titan Key Waterproof Capsule! Arcanus 55 is the complete personal security stack. Your passwords and private documents are kept safe on a portable encrypted USB drive. A Waterproof Capsule shields your USB and Titan Security Key from physical damage. The Virtual Keyboard Chrome extension protects your information on bank, tax or shopping websites. Arcanus 55 protects the information that you value most. 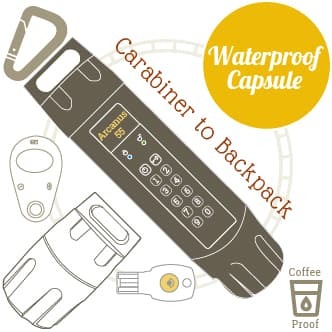 Its powerful 256-bit encryption in an extremely reliable, airtight, waterproof capsule. Arcanus 55 is the complete personal security stack. It's a multi-layered defense against realistic everyday threats. Your private files are safely encrypted onto a portable USB. 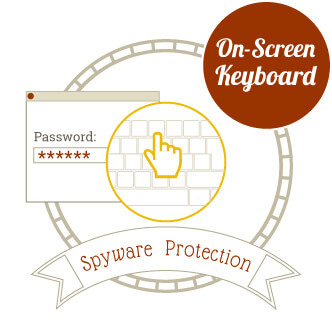 An integrated On-Screen Keyboard protects your passwords. Meaning that your passwords are safe even if the computer has been compromised. The USB hardware is 256-bit AES encrypted and onboard keypad PIN authenticated. Data is encrypted in realtime and the data remains encrypted while the drive is at rest. The KeePass Password Safe stores passwords in an encrypted database on our portable USB drive. Remember One Password for Life. The A55 Virtual Keyboard allows you to enter passwords and credit card information without ever touching the keyboard. The A55 Capsules are extremely reliable, airtight, waterproof, crush-proof, and tamper evident physical shields for all your digital devices. I need to keep my documents safe. I need a convenient place to store legal, medical and tax files. My laptop was stolen from my backpack. I need my private files and photos protected. I've lost an important USB stick. I need my files and photos secured even if misplaced or stolen. I will never click I FORGOT MY PASSWORD again. I need one simple and secure password. I have too many passwords. I don't want to pay monthly for a Cloud password service. I want one single Master Password. My employer trusts me with proprietary information. I don't want to be the cause of a Data Breach headline. I trust Arcanus 55 to protect my important files. I have a practical real-world solution that is very Easy to Use. I already have a Hardware Wallet for crypto but I need safe storage for my personal documents, private keys, and passphrases. I want my passwords encrypted digitally but I am afraid to type it into a keyboard. I need protection from keyloggers and ransomware. I don't trust crypto exchanges. I need a solution that is private and available 24/7. Exchanges are not FDIC insured, unlike bank deposits, coins just vanish in the case of a bank run or business failure. I have too many complex passwords to remember. I need one single Master Password and I don't want to pay monthly for a Cloud solution. My handwritten passphrase can be easily photographed. I don't feel comfortable simply hiding it. I need it protected even if it is lost or stolen. I have way too many complex passwords. I need a single Master Password and I don't want to pay monthly forever for a Cloud solution. Relying on an Encrypted USB for privacy and security makes sense. But I need something that I won't drop, forget or lose. I need to protect my encrypted USB drive from loss or damage. I can't go without access to my email and calendar. It's too important to lose. I need to keep Tax, Legal, and Medical documents in a safe location. I also want a simple and reliable backup solution for my photos and videos. I've lost my keys. I've dropped my keys. I've locked my keys in my car. I don't feel comfortable keeping my Titan | Yubikey on a keychain. My fear is that the Titan Security Key is damaged or lost. I can't afford to be more than a week without access to my email account. I trust Arcanus 55 to protect my Titan Security Keys. I have a waterproof and airtight shield that is extremely reliable. Arcanus 55 protects the information that you value most. Its safely sealed in an extremely reliable, airtight, and waterproof capsule. Arcanus 55 is the complete personal security stack. It is a portable defense against common everyday threats. Safely travel with your security keys in a stress-free accident-proof capsule. The family of waterproof capsules can be configured to shield Titan Security Keys and the Arcanus 55 Encrypted USB drive. 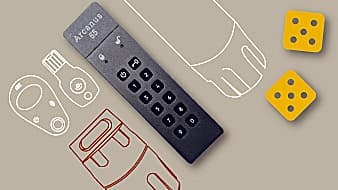 Arcanus 55 is the practical and convenient storage platform for your private keys, passphrases and paper wallets. Arcanus 55 is a flexible security platform that can be utilized in different ways to meet your unique needs. It is a practical defense against realistic threats while still making it's precious data easily accessible. The A55 Encrypted USB can be easily accessed from Windows, Mac or Linux. Think of it as a portable safe. It is a myth that paper is safer than digital. The encrypted A55 USB device encased in the A55 Capsule is a formidable defense. It has many advantages as a cold storage medium. If your mnemonic passphrase is photographed on either paper or steel, you will lose your cryptocurrency. If the A55 USB device is stolen you will not lose your cryptocurrency. It's that simple. The A55 Virtual Keyboard is a truly a stealth wonder. It defeats keyloggers, screen loggers, clipboard loggers, hardware loggers and acoustic listening devices. The A55 solution adds an extra layer of defense when stored in a safety deposit box because the device is encrypted at rest it protects against photographing or forfeiture. The A55 Capsules are extremely reliable, airtight, waterproof, crush-proof, and tamper evident physical shield for your digital devices. 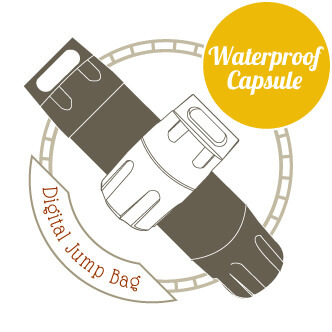 It´s your "Digital Jump Bag". Arcanus 55 is the complete personal security stack. Easy to Use: Simply enter your PIN, plug it into your USB and copy files. The files will automatically be encrypted as they are copied. When you remove the USB it will lock itself. Put the device back in it's capsule and store in a safe place. Yeah, It's that easy. The A55 USB device is 256-bit AES encrypted and onboard keypad PIN authenticated. Data is encrypted on the fly and the data remains encrypted while the drive is at rest. This hardened drive has brute-force defense, and eject auto lock. The A55 solution can protect any files that you need kept private. You can safely store insurance, tax, legal and medical documents. Feel safer providing your SSN and Tax details online when you are protected by 256b AES Encryption. Even if your computer is infected your documents are safe. Arcanus 55 is the ideal solution for enterprise private key backups. Arcanus secures and protects PEM files, SSH keys, SFTP keys, TrueCrypt keyfiles, and BitLocker Recovery Keys. The encrypted A55 USB device encased in the A55 Capsule is a formidable defense. It has many advantages as a cold storage medium. It is a myth that paper is safer than digital. While it is true paper cannot be hacked, it is easily lost, burnt, or simply photographed. An attacker with no technical skill can easily compromise paper / etched steel. The A55 capsule is an airtight, waterproof, crush-proof, and tamper evident Faraday shield for your digital devices. Clips easily with a carabiner to your backpack. It's your "Digital Jump Bag". The A55 Capsule defends your devices. It protects from everyday accidents like a coffee spill or a ride in the washing machine in the pocket of your jeans. Holding the A55 Capsule gives you a feeling of value, like a bar of gold. Not something that would accidentally slide between the sofa cushions. The A55 Capsule has enough room for more than one USB device, Titan Security key, adapter and even a folded paper. The tight metal seal creates an effective USB Faraday Cage, shielding and disopating RF energy in case of EMP or severe solar storm. Use the A55 Virtual Keyboard on any website. Type passwords without touching the keyboard. A KeyLogger is a program that infects your computer and records all of you keyboard activity. It captures your passwords, credit cards and Social Security Number. The Arcanus 55 On-Screen Keyboard is in your browser. It protects you on any bank, tax or shopping website. The Arcanus 55 Solution utilizes the KeePass Password Safe. KeePass stores usernames, passwords, and other fields, including free-form notes and file attachments, in an encrypted database. This file is protected by a Single Master Password or key file. The KeePass database is stored on a portable USB (No Costly Cloud Storage). We vertically integrate the best of breed privacy platforms on behalf of the individual. We believe that information privacy is vital for a free and safe quality of life. When applied to personal safety and property ownership privacy is a fundamental human right. It has become increasingly difficult for individuals to maintain a secure and private digital lifestyle. We are forced to remember as many as 55 unique and complex passwords. This leads to irresponsible behavior such as writing down or reusing passwords. We can do better. Can I use Arcanus 55 to backup my private photos from my phone? Yes. The USB device attaches to smartphones and will hold photos and videos safely and securely. Can I store my Last Will and Testament on the Arcanus 55 USB device? Yes. You can store legal documents on the Arcanus 55 drive and share the PIN with your last will and testament executor. Should I store my Titan Security Keys in separate locations in case I lose one. Yes. We recommend carrying the wireless key inside a capsule attached to the inside pocket of your backpack or briefcase. The other USB key can be stored inside a capsule off-site, at home, or in a safe. Is this A55 USB device coffee spill and washing machine proof? When in the A55 capsule it is absolutely waterproof and crush-proof. Can I safely enter my SSN on an online Tax preparation site without the keystrokes being recorded? 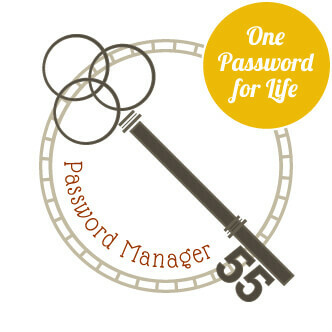 I can't remember all my passwords, how can the password manager help me? You need to remember only one password. Never again type a user ID or password, both can be copied and pasted from KeePass into sites that need them. You can also add notes or comments to any password allowing you to record security questions and answers (Windows Only). Will the A55 USB Device self lock if left unattended? For example, I leave it unlocked on my desk. The device will instantly lock when removed from the USB port. Will a Ledger Nano X fit inside the A55 Capsule with the A55 USB device? Yes. Both devices can be sealed inside the A55 Capsule together. Can I store the A55 USB Device / Capsule in a Safety Deposit box. Yes. Because the device is encrypted at rest it adds an extra layer of security against photographing or forfeiture. Is Arcanus 55 a suitable platform for enterprise private key backup and storage? Arcanus 55 is the ideal solution for enterprise private key backups. Arcanus secures and protects PEM files, SSH keys, SFTP keys, TrueCrypt keyfiles, and BitLocker Recovery Keys. Can I safely store financial, legal, medical and tax documents on the A55 USB device. Yes. There is plenty of room to store any type of document that you need kept safe. Will the A55 USB Device work if the battery is dead? Yes. Simply insert into the UBS port and it will power up. Can I have Arcanus 55 shipped outside the US? Can I have Arcanus 55 shipped to a US territory outside the continental US? Yes. Additional shipping fees apply. How many attempts do I have to enter the correct PIN before I am locked out? After sixteen (5) bad PIN numbers the device will assume it is under a brute force attack and shut down. Can I save paper wallets on the A55 USB Device as PDFs? Yes. The device will encrypt on the fly, so that the documents will be secured as they are transferred to the USB device. This can be done from Win, Mac and/or Linux. Can I safely store my 24 word passphrase on the A55 USB Device? Yes. The main advantages to this approach are that you can store them digitally without typing them (see hardware keyloggger), and If the device is ever taken the BIPx phrases will remain secure. Where can I find the A55 Virtual Keyboard Chrome Extension? Can I put the A55 Virtual Keyboard on my website? What is the purpose of the gold skeleton key? The gold key is merely branding steampunk vibe swag. It has no functional purpose except as a bottle opener. The size of key may vary. Very cool. I showed people at work and now they all want one. Thanks for the quick response. I am very pleased! I would be glad to help beta test the next version. I lost my arcanus USB. It was good to know that my data was still safe (I found it later). Thanks for the piece of mind during Tax season. Very useful toolkit. I am going to order another one. Excellent. This thing has many more uses than just crypto. Transfered my Coinbase account today, thanks. My wireless key FOB was scratched after one week on my keyring. My proprietary designs were saved by an encrypted USB thumb drive. A very flexible cold storage solution I prefer the Titan key capsule secured inside my backpack with a carabiner. A good Hardware Wallet Plan B Two laptops were stolen from my car. Now, with Arcanus, I am prepared for anything. The added security of a 16 number PIN is something you don't think about until you need. Ironically those that choose digital currency over paper choose paper security over digital. I've been looking for PORTABLE Password Manager that doesn't require the Cloud. One password is alot easier to manage and I do not want pay a monthly fee to keep my passwords on the cloud. I will never click I FORGOT MY PASSWORD again. I've bought Cheaper Encrypted USBs that lasted only a week. This USB feels solid and well made, not cheap. Half the price and more storage than an Ironkey All I can say: there is nothing better on the market!!! We have stored copies of our important household and personal papers on the drive and we carry this when we travel in case of an emergency. We do not store any identifiable information about you. Meaning that we do not store credit card, email, phone or address. All information necessary to process your order is securely transmitted to our PCI compliant credit card vender. Subscribe to the Arcanus 55 newsletter now. Get the latest Articles, Coupons and Alerts delivered to your inbox. Arcanus 55 scans the web for stolen or leaked email addresses and will notify you instantly if your information has been located.